Houdini & Doyle: Cancel or Renew for Season Two? Airing on FOX on Monday nights, Houdini & Doyle recently completed its first season. Will the series be returning for a season two? Should there be a second season? A mystery adventure series, Houdini & Doyle revolves around the uneasy partnership of two legendary figures of the early 20th Century. Harry Houdini (Michael Weston) is a master magician and paranormal debunker while famed author Arthur Conan Doyle (Stephen Mangan) is a paranormal aficionado. They’re teamed with Constable Adelaide Stratton (Rebecca Liddiard) to solve cases that may have roots in the supernatural. Looking at the ratings, it’s clear that Houdini & Doyle wasn’t a big winner for FOX. However, the network didn’t produce the series so it presumably didn’t cost them a lot either. The show was produced by a number of companies and aired in the UK and Canada, as well as the United States. Because there are so many pieces of the financial puzzle, the show’s fate is difficult to predict. We’ll have to wait and see on this one. But, what do you think? 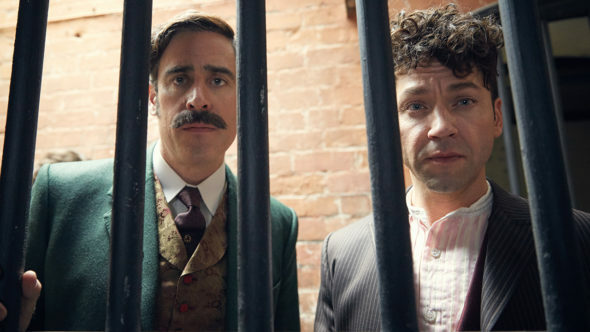 Should Houdini & Doyle be cancelled or renewed for a second season? Were you satisfied by the first season finale or, do you want more? 8/2 update: FOX has cancelled Houdini & Doyle after one season. Details here. Please bring this show back it was awesome!!!!! This was a great show – how can you cancel something so entertaining? I really looked forward to something my husband and I enjoyed watching together. It had great story plots – bring it back on any network, I’d watch it!!!! some of us do NOT like reality shows, which are just plain awful. If Houdini and Doyle cannot put back on, then I will not step down until it does or other network will take over that. Houdini and Doyle deserves to be renewed. it was one of few shows that I actually watched and enjoyed. I heard it was cancelled and I hoped it was a joke, but I also heard that Netflix took over the rights to it…. Please bring back Houdini and Doyle. I loved it and was looking forward to a second season. I loved the female constable Adelaide , she was before her time. Please renew Houdini & Doyle. One of my favorite TV Series. Thank you. They take off the good stuff and leave the crap on. Maybe that’s why more people watch cable shows!